I am late in posting this (I actually started working on it in March) but on the heels of the scheduled iPhone 5 announcement I didn’t want to sit on it any longer. Of course this is another post about technology, as if you couldn’t tell what my number one passion is. Although I have been using technology heavily for over a decade now; 2011 has really been something else in terms of the total digitization of our real world activities. This year has without a doubt been the most digitally liberating of any year since smartphones first took hold in 2007. I started this year of digital progression by converting our collection of DVD’s to iTunes movie files. That conversion involved ripping the DVD’s into iTunes formatted video via HandBrake and also purchasing movies both owned and new through iTunes. This change over has been particularly freeing because we are able to scroll the Apple TV for all of our movies ‘On Demand’ style with no disc swapping or reading DVD jackets. We were also able to give away our old movie discs we no longer needed to our friends. Early Christmas presents you might say. Additionally, as the iCloud services begin to roll out, we have been extended the ability (thank you Apple) to access all of our purchased TV shows via any of our iDevices over the web. Music has also been enabled and I’m pretty sure movies will be available down the road. Another area of our life that technology has been particularly helpful this year has been in handling our finances. We have been utilizing more and more mobile payment apps which allows us to carry less plastic (see Square Card Case). Earlier in the year I started using another Square App that allowed me to take credit card payments from friends and clients a la swipe style, collect a signature and send a detailed email receipt with location and purchase information. Instant business 3.0 without the fuss. Solutions like this are changing the dynamics of consumer and business interaction. Other services are popping up everywhere that are further liberating the worker from the office, kids from heavy & burdensome textbooks, and musicians from the prison of major labels; among so many practical applications. Back at home, I am now checking all my balances (from travel, to utilities, to banks and credit cards) every morning within about 3 clicks. I can pay statements and manage money without leaving bed. We don’t waste time worrying about checks, envelopes, stamps, receipts, etc. The end result is being on top of our finances with one device and hopefully one day, no wallet. In fact, efficiency operating on many levels and dimensions is the direction we have clearly felt 2011 is taking us. Full and unbridled Home/Life automation that affords us time to do more and spend more time at what matters most to us. If you haven’t yet tapped into these powers yet, check out this list of examples of what has rolled out this year and been implemented into our lives. Ability to manage your ADT system from iPhone. Ability to watch shows and manage DVR from mobile devices with XFinity. Paying rent in a few clicks with RentPayment. Checking in and boarding via Delta applications. Saving trees by trading print publications for digital ones on our iPads thanks to Zinio, Flipboard, and others. So what’s next for us in this digital progression? 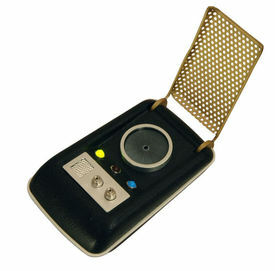 As a kid I watched Star Trek with my dad and awed as Kirk and the others used the Star Trek communicator to do virtually everything and thought to myself, how nice that would be. I think we are getting there. With so much functionality already given to us, we will still see this year the rise of Near Field Communication that will enable all sorts of payment applications like Google Wallet, future secure ID’s, and deeper connections between your device, car, home, computer, etc. Additionally, services like the hopefully upcoming iPhone Personal Assistant, will make go getters of us all and give the physically handicapped a whole new level of freedom. Truly defining will be how the rise of cloud services will influence our buying decisions (dropbox, amazon web services, etc). I believe that smaller disc space capacity devices with slimmer profiles will become the growing preferred standard because massive local storage is no longer required. As a final note, it is clear that collecting the best apps along with buying digital movies, books, magazines and music isn’t cheap; especially when you try and transition whole libraries. So, I recommend buying iTunes Gift cards via specials and in bulk when ever possible (i.e. the occasional Best Buy and Target deals such as $50 iTunes card for $25, or Costco discounts, etc. ).